Description: The Houston Livestock Show and Rodeo’s lineup has been revealed, so we thought it was time to go denim! 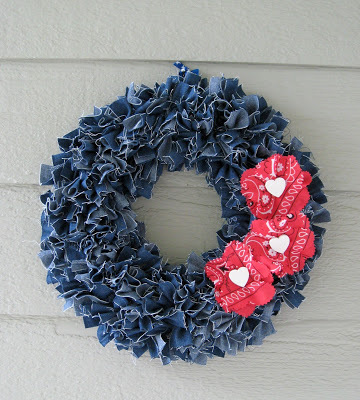 Join us this month to make your front door or mantle this full and fluffy denim rag wreath. Super easy technique – just cut and tie. A great opportunity to talk to friends while you tie knots! and the bandana embellishment will be detachable if you want to go denim all year around! Project supplies include: Denim, Wreath Form, Bandana. RSVPs and cancellations for this craft are due by Wednesday, January 20 so we have enough supplies. If you need to cancel after this date, please let us know and we will email you an invoice and set up a time for you to pick up a kit. *$1 added for Credit Card/PayPal payment.